Once again, the Gray Book is misleading. As the table below shows, Premiers have been reported in runs that are stated as being straight ATC movements and straight ATC movements have been reported in runs that are supposed to be all Premiers. As with all things Waltham, there are some added twists. The first 845 movements reported are from ATC runs. The first run of 845s listed in the Gray Book is 12577501-12577600, a run of hunting case movements but the earliest reported 845 is 12053831. As a further complication, 2 Sidereal movements have been reported in the 11071801-11072500 run. 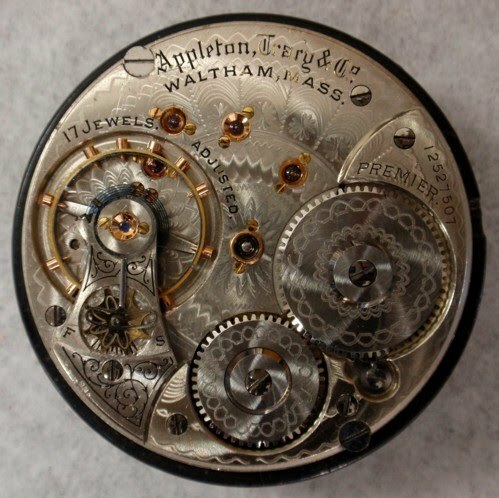 As an aside, in the 18 million serial number range, Waltham makes some ATCs that are adjusted to 5 Positions and marks them as such but does not mark them "Premier". *Listed in the Gray Book as 17-21 jewel movements. There has been no attempt to determine a production figure for the Appleton Tracy Premier. In most cases there has not been enough of them reported in a given run to determine if they were made in groups or randomly throughout a run. The above table is presented to show the number of movements in a run and how many Premiers have been reported in relation to how many straight ATCs have been reported and perhaps give a sense of how many were made. This classification would change if Premiers are reported outside the above ranges.